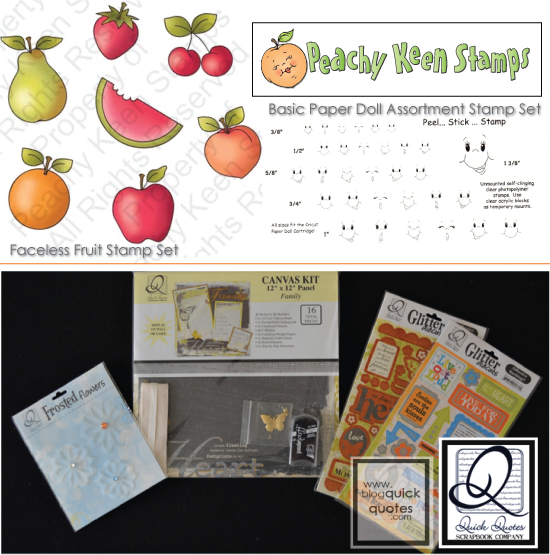 Thank you so much for joining us for the Peachy Keen Stamps/Quick Quotes Blog Hop! If you've just come from Lisa's Blog ,then you are hopping along just fine. If not, make sure you start at the beginning over at Quick Quotes' blog so you don't miss a single chance to win one of two fun prizes up for grabs! You'll have until Sunday night to complete the hop. For my first card, I used the Mark and Sharen Love Frogs stamp set from Peachy Keen Stamps, and this beautiful French Quarter paper from Quick Quotes. The frog images were stamped on Express It Blending card with Memento tuxedo black ink, and colored with Copic markers. A little blue seam binding ribbon, rhinestones, and stickles frilled and sparkled this card in all the right places, and the "Once Upon A Time" sentiment is a beautiful vellum quote that was trimmed to fit my card. This quote went just beautifully with this image and the "Happily Ever After" stamped sentiment. My second card also showcases some of the French Quarter double sided paper, and yet another of the vellum quotes from Quick Quotes. I have to say that this paper is wonderful to work with. It's excellent quality, and heavy weight make it just perfect for so many paper crafting projects. I REALLY love it!! When I saw this quote "Love is the dance of eternity", I thought immediately of this adorable Mistletoe Twist stamp set from Peachy Keen Stamps. These cute little gingers dancing are the perfect pairing with that sentiment. For my final project, I went a bit more elegant with this free standing pop-up card. This view is when it's folded flat. I used the Faceless Flowers stamp sets from Peachy Keen for embellishments on this card. I stamped them with black Powder Puff Chalking Inks (available at Quick Quotes), and added black glitter for the centers. The edges of the flowers were sponged with Tim Holtz vintage photo distress ink. Here is a photo of the card popped up. The sentiment is one of Quick Quotes Vintage Alphabet Quote cards, and also matches the French Quarter collection. Besides the flowers, ivory organza ribbon was all that was needed to finish this card. Thanks again for stopping by! I hope you're inspired and ready to create! Don't forget to leave a comment on each designers' blog for a chance to win either a Quick Quotes prize package or two stamp sets from Peachy Keen!The deadline for commenting is 11:59pm EDT, Sunday, September 18th. Here's a look at what you could win. Your next stop on the hop is Melin Beltran's Blog. Thanks so much for hopping along today. Have a wonderful weekend and happy stamping!! Adorable projects I love your frog card so cute!!! Thanks for sharing your projects, they are beautiful. love these....love the pumpkin head....thanks for sharing! Beautiful! all of them! Love the little frogs, the ribbon and color of paper just perfect! omg!!!! I love your cards!!! LOVE! so whimsical and fantasy like!! WOw I love all of your projects....TFS!! First two cards are very sweet and the third is fantastic! I love your cards. Thanks for sharing them. The frogs are adorable. I love them. Great projects. Love the pop-up card and all the flowers. OMGoodness Lorie! Amazing as always! I am so fascinated and amazed by your coloring skills! Your projects glow and pop off the page! 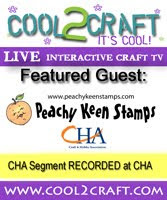 You did a fabulous job merging the Quick Quotes with the Peachy Keen stamps. The final project is so stunning! I love the quote and the inked flowers! It is gorgeous! Always a delight to visit your blog, my friend! Your cards are so adorable!! Thanks for sharing! Love the frogs and really love your free standing pop-up card, so elegant. Would love to see how you did that! That pop-up card is awesome! Your projects are beautiful! Lovely job!! Wonderful cards, I especially like the frog card beautiful. good job! Totally fabulous! I love the pop up card!! Such beautiful projects, thanks for sharing them. Love it all--especially the frogs. I love your frog card and your project is amazing. great work. thank you for sharing. Yowzer, Lorie ... your projects always amaze me. You are so very talented. Thank you so much for sharing!! beautiful and elegant even with the frog stamps!! :) i love them all Laurie! very cute cards & projects. tfs. Great Projects. Love that Once upon a time card. Lorie - you got a gift with paper! Beautiful work! Peachy Keen Challenge #60 Let It Snow! !